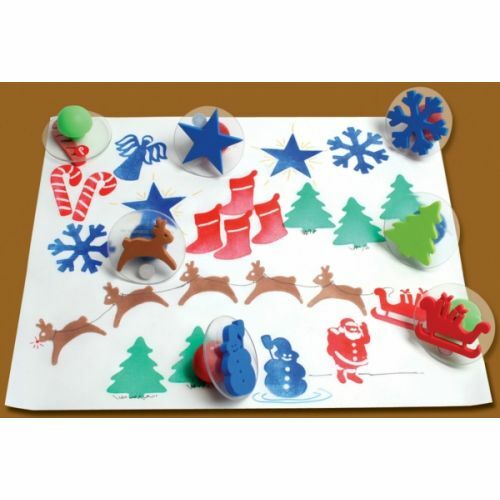 This set of 3" diameter Christmas stamps will make your family's card giving and gift wrapping into fun projects. Each stamp is mounted on clear plastic with an easy to grip large handle that is just right for a child. The durable, high density foam is easy to clean and a picture on top makes the image a snap to align. These stamps are ideal to use with our paint or ink pads. This set includes an angel, a pine tree, a reindeer, a sleigh, Santa, a snowman, a snowflake, a stocking, a candy cane, and a star.